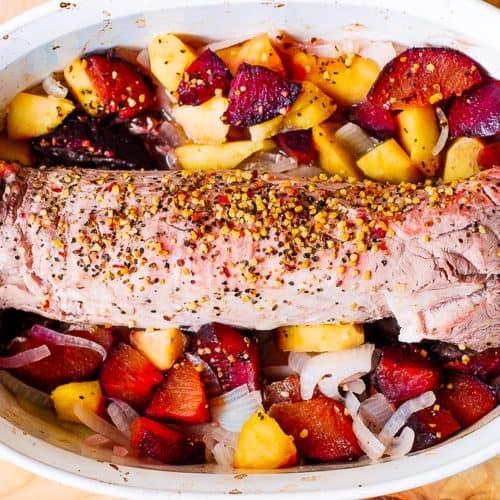 Oven roasted pork tenderloin with apples and plums – pork and fruit baked together in a casserole dish produce fantastic flavors! 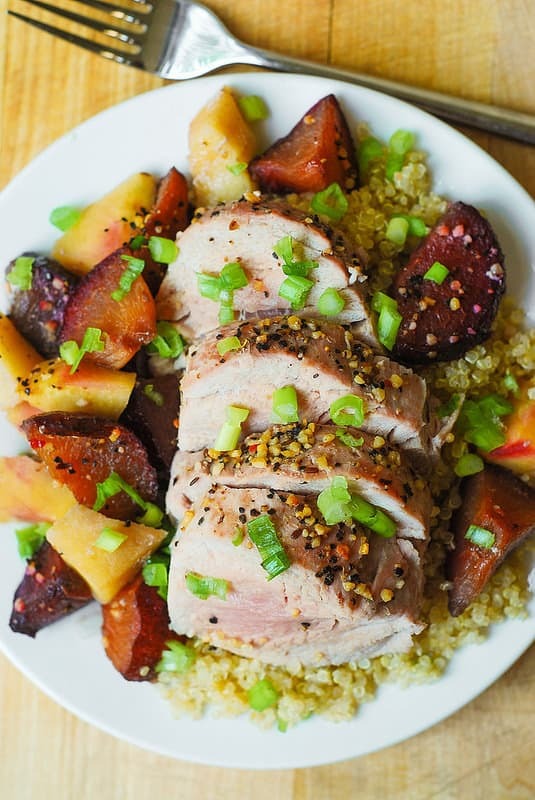 If you ever wondered what you could do with those plums you see on the market this time of the year – make this pork with apples and plums or this Pork Tenderloin with Sweet Balsamic Plum Sauce! 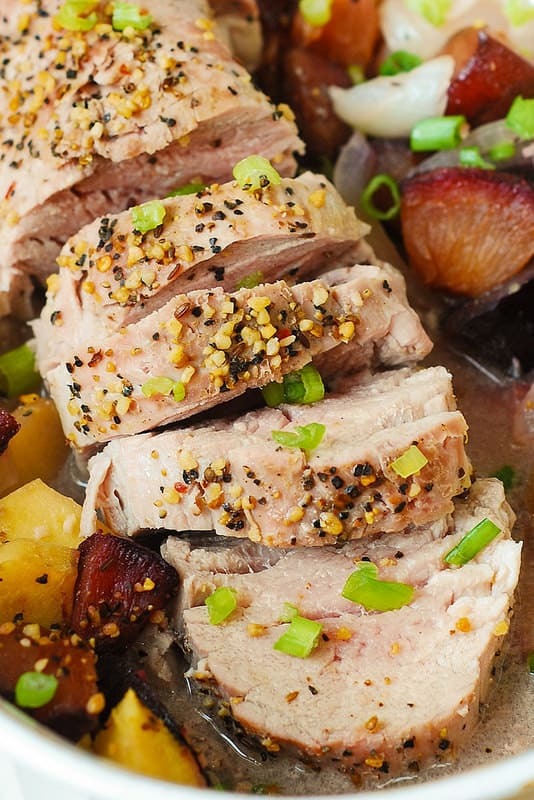 Plums (together with apples) are great in a pork tenderloin dish. 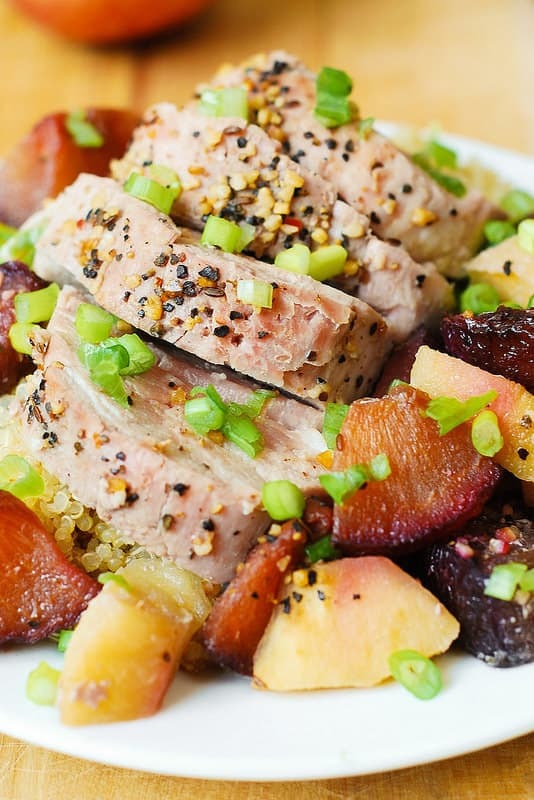 This dish is very flavorful – I seasoned the pork and the fruit with the Montreal seasoning, and there is a lot of flavor interplay going on (savory and sweet, fruity and meaty) – so delicious! The fruit perfectly complements the flavors of generously seasoned pork. Pork is juicy and moist every time! Super easy dinner recipe that you can make any day of the week! It’s also gluten free! I also loved the colorfulness of this dish! First, scatter sliced onions on the bottom of the casserole dish over melted butter. Place sliced plums and apples over the onions. Next, generously sprinkle Montreal seasoning (or salt and pepper, or other favorite rub) over the top of the pork tenderloin and fruit. 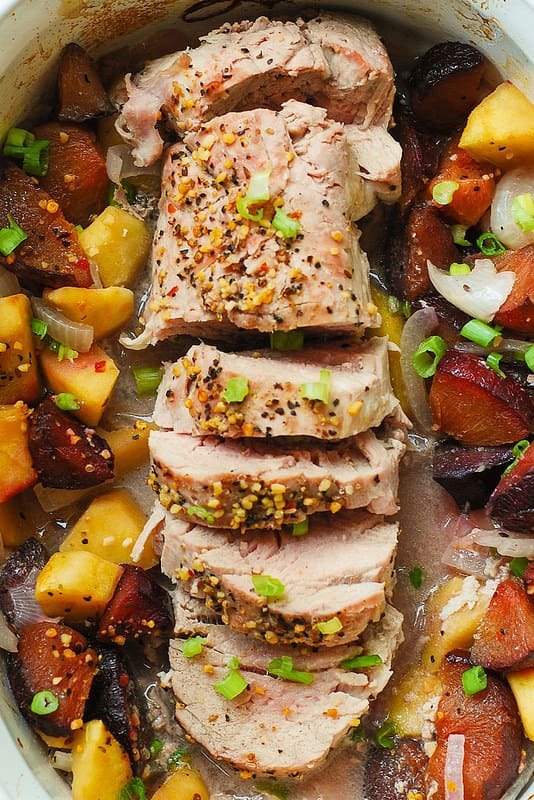 Place pork tenderloin on top of the fruit into the casserole dish. Make sure the seasoning stays on top of the tenderloin. Loosely cover the casserole pan with aluminum foil and roast the pork for 30-40 minutes in a preheated oven at 425 F, until the tenderloin is cooked through and pale pink in the center, or until a thermometer inserted into the center of the pork reads at least 145 degrees F (63 degrees C). Depending on your oven, you might have to bake pork tenderloin longer than 30-40 minutes. To serve, slice the pork into 1-inch thick slices, and serve on top of cooked apples and plums. Brown Sugar, Garlic and Herb Pork Tenderloin – juicy and tender on the inside, with a sweet garlicky crust on the outside, only 45 minutes from start to finish! No marinade or searing required! Pork Tenderloin with Mustard, Garlic and Herbs – this tenderloin is baked to perfection in the oven and is low in carbs and calories. 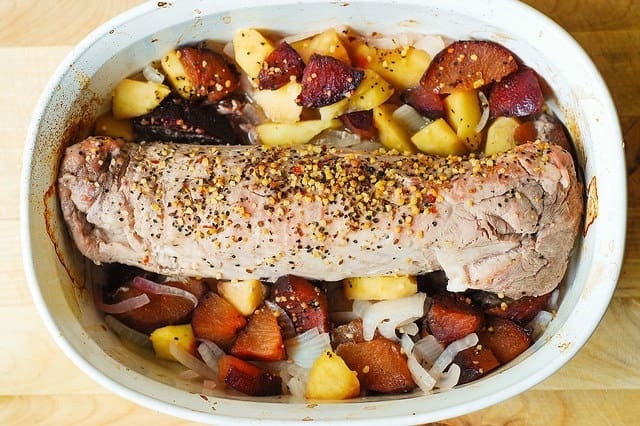 Pork tenderloin roasted in the oven with apples and plums in a casserole dish. Delicious, gluten free dinner recipe. Preheat oven to 425 F. Melt butter in 2.5 quart oval casserole dish ( 13 inches * 9 inches *4 inches deep). Trim the tenderloin of any silver skin (optional). Scatter sliced onions on the bottom of the casserole dish (where you melted butter). 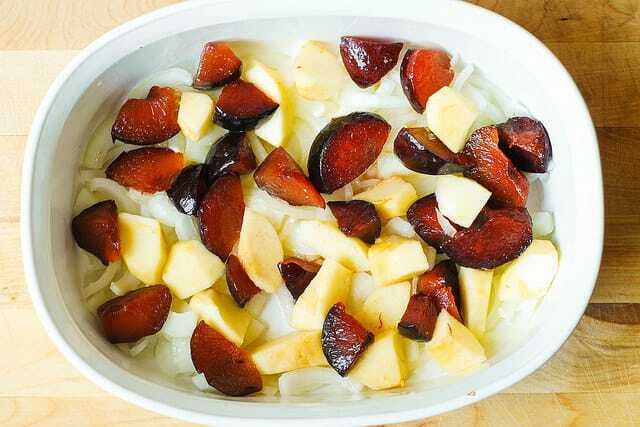 Place sliced plums and apples over the onions. Generously sprinkle Montreal seasoning (or salt and pepper, or other favorite rub) over the top of the pork tenderloin and fruit. 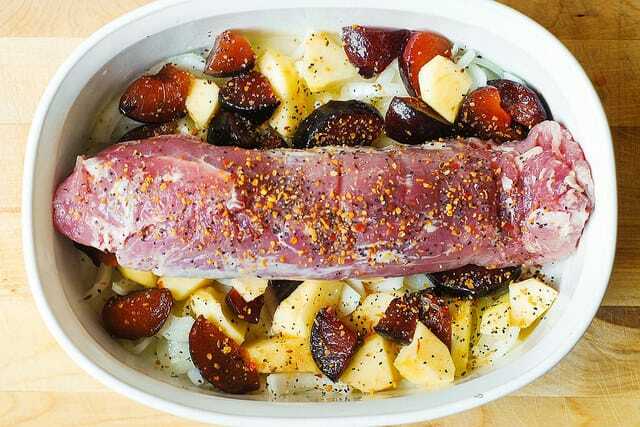 Place pork tenderloin on top of the fruit into the casserole dish. Make sure the seasoning stays on top of the tenderloin. Loosely cover the casserole pan with aluminum foil and bake for 30-40 minutes in a preheated oven at 425 F, until the tenderloin is cooked through and pale pink in the center, or until a thermometer inserted into the center of the pork reads at least 145 degrees F (63 degrees C). Depending on your oven, you might have to cook pork longer than 30-40 minutes. Remove the casserole dish with the pork tenderloin from the oven and slice the pork in the center to check for desired doneness - if it's too pink for you, cover the pan tightly with foil and let it sit for 10-15 minutes on the counter. I love apples and pork together! This sounds wonderful!